Loot. You want it. You love it. You curse in frustration trying to come up with something more exciting than "100 gold pieces and a +1 flaming sword." The Treasure Hoard is here to save you! 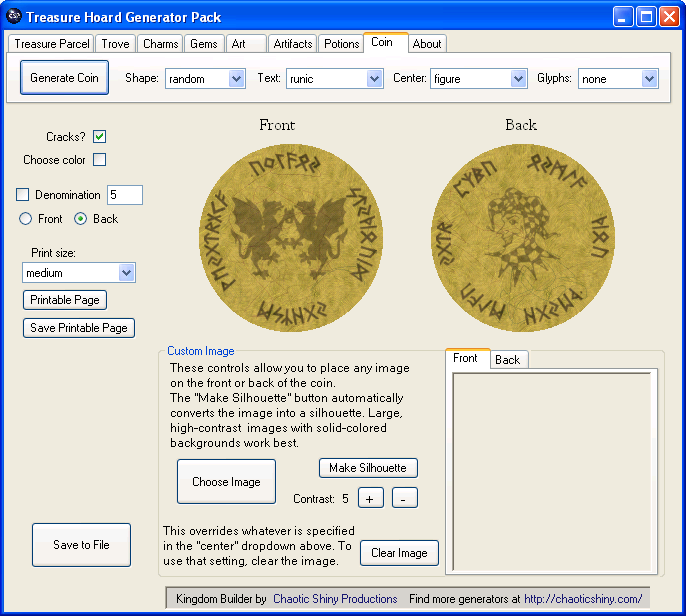 Generate descriptions of loot, or pictures of coins. As many coins as you need. All in one product. The Treasure Hoard contains the Charm, Gemstone, Magical Artifact, Art Object, Potion, and Treasure Trove generators from Chaotic Shiny in new and improved forms, as well as the brand-new Treasure Parcel generator and a graphical coin generator. That's right - a near-infinite number of fantastic coins ready to be printed out and stuck in your games. 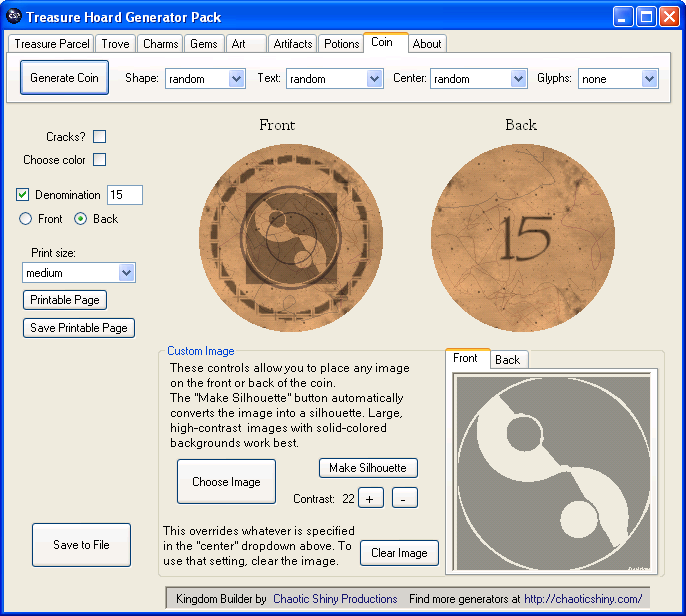 You can even place your own images on coins; the generator can automatically convert them into silhouettes for you. 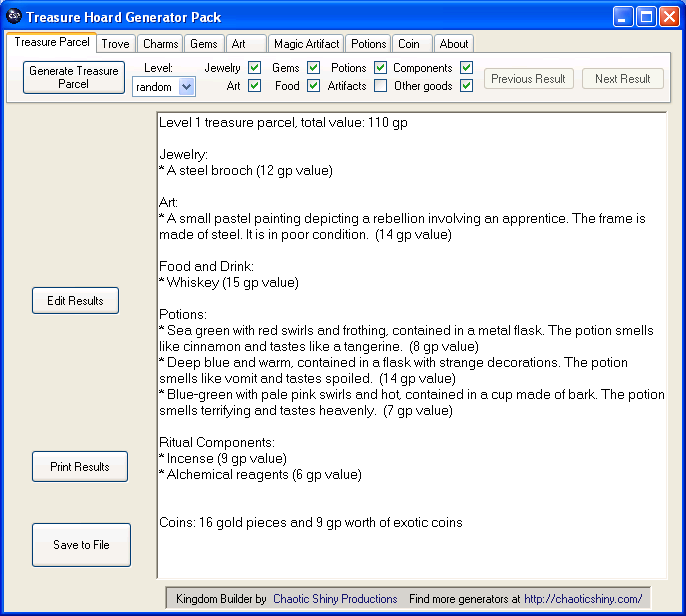 Generates tons of system-neutral loot, plus some inspiration for D&D-specific stuff, and the Treasure Parcel generator follows D&D 4e's gp value guidelines. 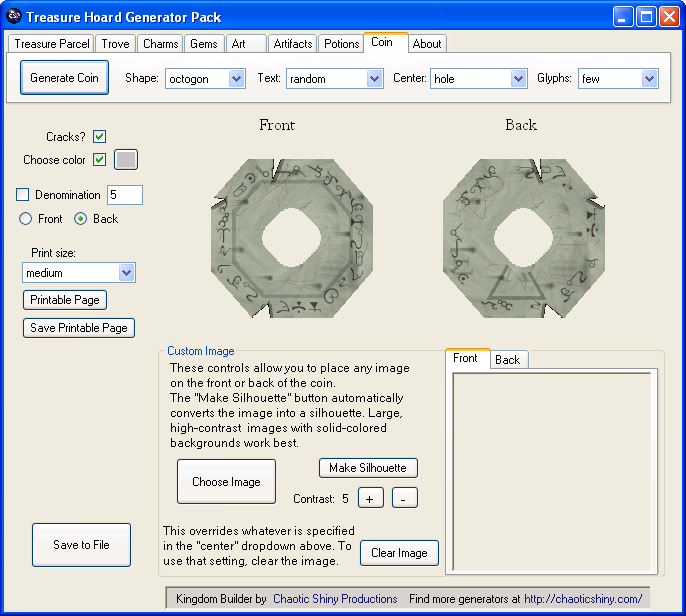 The Treasure Hoard was written in .NET, which means that it will run on Windows XP or newer, plus any Mac or Linux machine that has an emulator for running .NET. (Some features, such as printing, might not work on emulators.) It was tested on Windows XP, Windows 7, Mac with Mono and Linux with Wine. It even has a "I am not running windows" button that hides or alters features that don't work on emulators!